This option for the design of the outer shell of the universal terrestrial dwelling is based on a variety of torus-shaped envelopes with a variety of configurations of internal activity spaces. So far, I have focused on creating a dwelling by encapsulating each activity-space in a separate envelope or shell. In the following designs, I simplify the structure of the whole dwelling by encapsulating all its activity-spaces in a single en­velope. The shape of envelope best suited to encapsulating all the activity-spaces together, in this way, is the torus. In the first design, shown on the right, I use a pentagonal arran­ge­ment internally, comprising five groups of three activity-spaces. On the left, the torus envelope is shown trans­parent, to reveal the inner arrangement of the activity-spaces. Each group of 3 activity-spaces comprises one 8-metre diameter room and two 5-metre diameter rooms. The five 8-metre dia­meter rooms form an inner circle within the torus and the ten 5-metre diameter rooms form an outer circle within the torus. All are linked by a central circular corridor. Each room has a skylight. The above versions of the torus dwelling were generated by POVray using the program torus.pov. As can be seen from the transparent diagram above, there is lots of waste space within the torus, which is not part of any activity-space. For this reason, I decided to drastically reduce the enclosed volume in the corridor areas by encapsulating the pure corridor sections in a smaller co-axial torus. 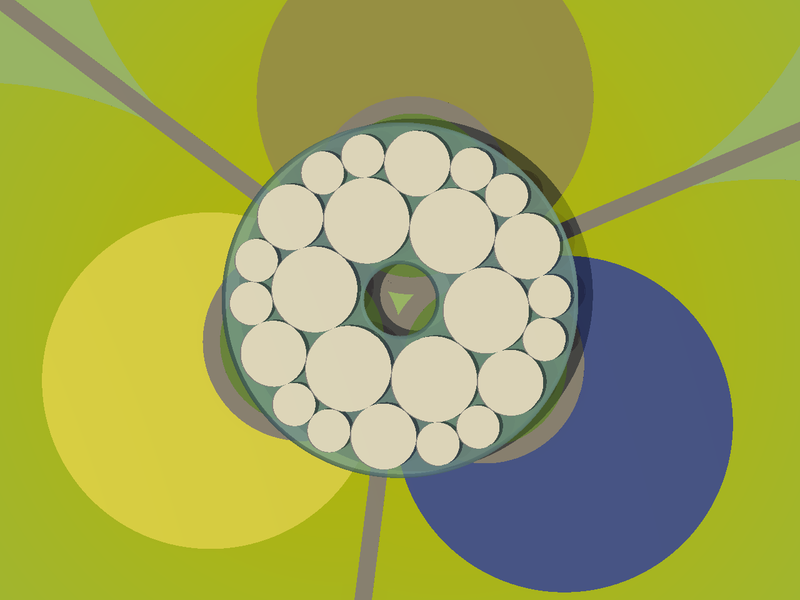 This resulted in the linked petal design shown on the right, which I dubbed the Torus-Flower. It struck me as quite a capt­ivating design. The 5 corridor sectors of the original torus were sliced off and discarded. The remaining 5 sec­tors - containing the activity-spaces - were sealed with half-ellipsoid end caps. These were then merged with a torus of the same major radius as the original, the same vertical minor radius, but with a much reduced horizontal minor radius. The saving of wasted enclosed volume is well indicated by the floor plan shown on the left. 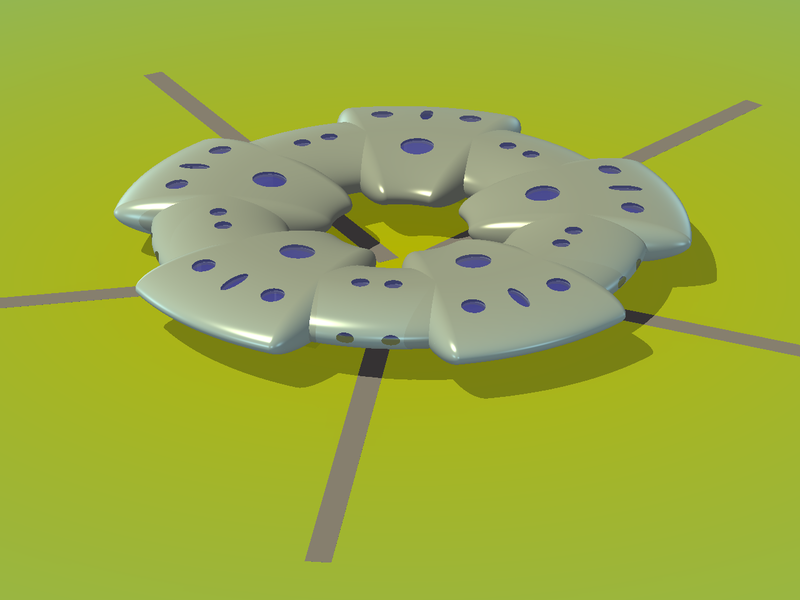 The Torus Flower version of the dwelling was generated by POVray using the program torus-flower.pov. 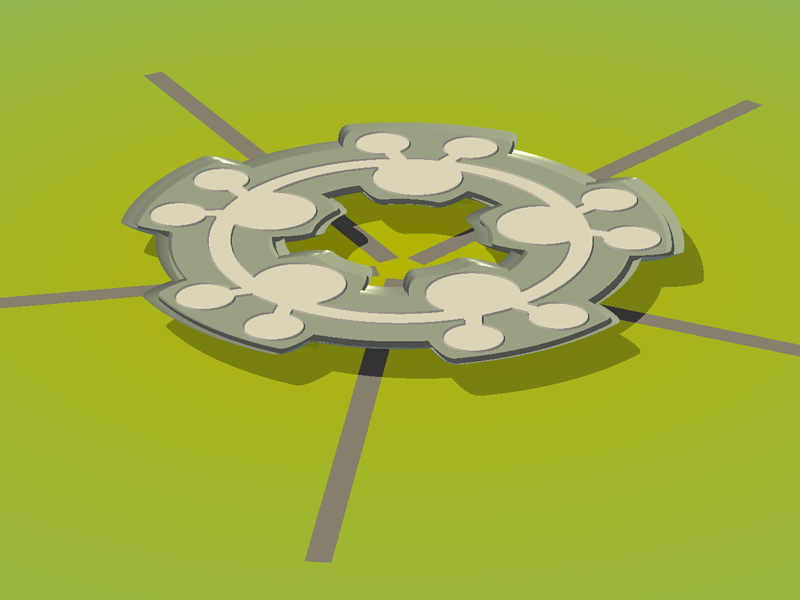 A horizontal panorama of the Torus-Flower dwelling is shown below. Although the Torus-Flower design reduced the amount of wasted space in the envelope, it still enclosed a lot of wasted space. I decided to try to overcome this shortcoming by mathematic­ally optimising the fitting of circular activity spa­ces into a torus profile. 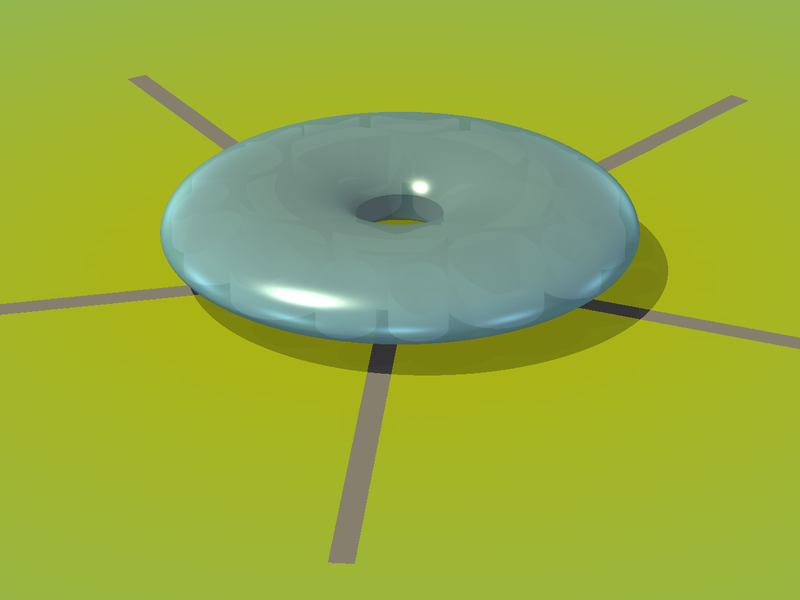 I therefore wrote a pro­gram lardocecu.java to calculate the optimum radii for 3 different sizes of circle which could fit together within a torus envelope with the mini­mum amount of wasted space. The principles of this rather complicated geometry are illustrated on the left. 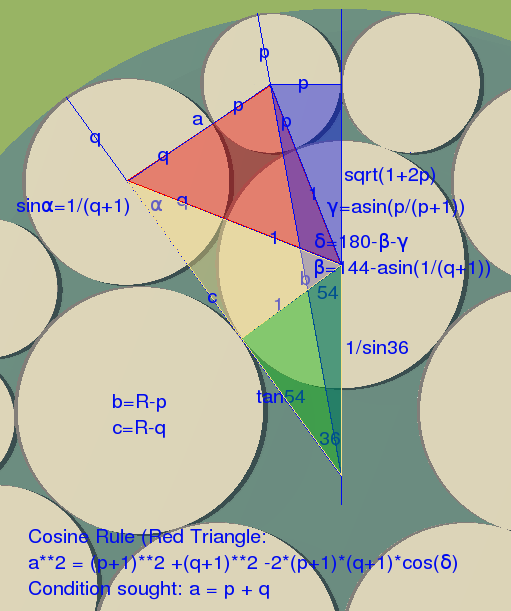 The Java program uses an iterative method to, in effect, optimise the relative areas of the coloured triangles. In essence, the prob­lem is to find out what other two sizes of circle are required to fit around the outside of the inner pentagon of large circles such that the outer circles all touch both each other and the outer circum­ference of the torus. This process is what determines the ratio between the major and minor horizontal radii of the torus. Unfortunately, this is what causes the hole in the middle to be much smaller than is desirable for an inner garden. 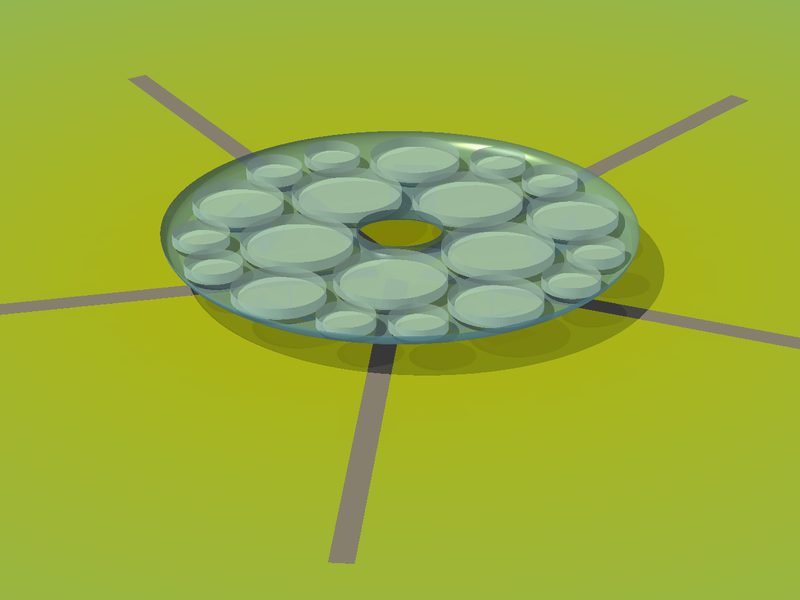 In this design, I decided to make the torus en­velope translucent, as shown on the left. The optimum way in which the activity areas fit snugly together can be clearly seen. 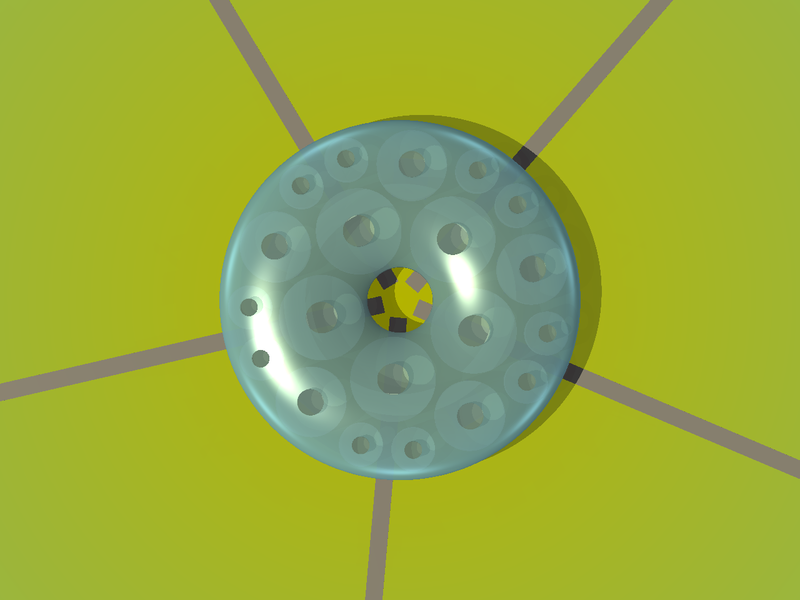 The math­ematical constraints resulted in the central hole being rather small. An inner garden is not therefore practical with this design. There is also no space for a corridor. Passage through the dwelling is therefore, of necessity, from one activity-space to another. Apart from the demise of the inner garden, another shortcoming of this design is the large variation in ceiling height from one room to another, and also within a single room. On the left is a cut-away view of the floors of the activity spaces. In this view, the torus has been sliced in half horizontally. 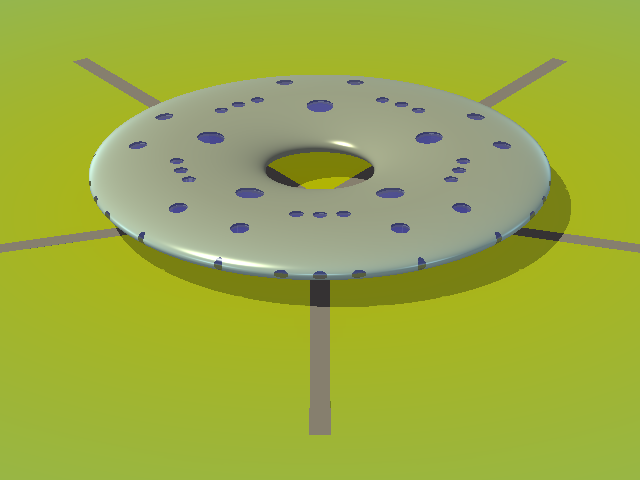 This advanced torus version of the dwelling was generated by POV ray using the program lardocecu1.pov. My general evaluation of this more advanced torus design is that, although the shape of the torus envelope is simple and smooth, it is very imposing and restrictive as regards the arranging of internal activity spaces. As a final experiment with this pentagonal arrangement, I therefore reverted to enclosing activity spaces indivi­dually with ellipsoidal envelopes, while keeping the same arrangement of activity spaces. I supported the individual activity-space envelopes by enclosing them within a toroidal framework of metal tubing. 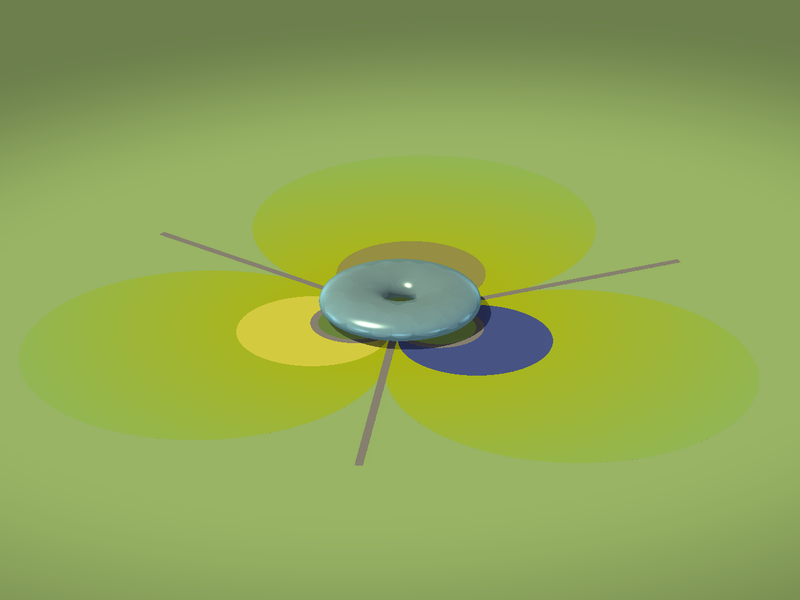 The result, generated by POVray using the program lardocecu2.pov, is shown below. As a final experiment with torus envelopes, I re­created the above version, but this time using a hexagonal rather than a pentagonal arrange­ment of activity-spaces. This enabled me to set this version of the dwelling within the 3-road gleba format that I had always used, and which I prefer. 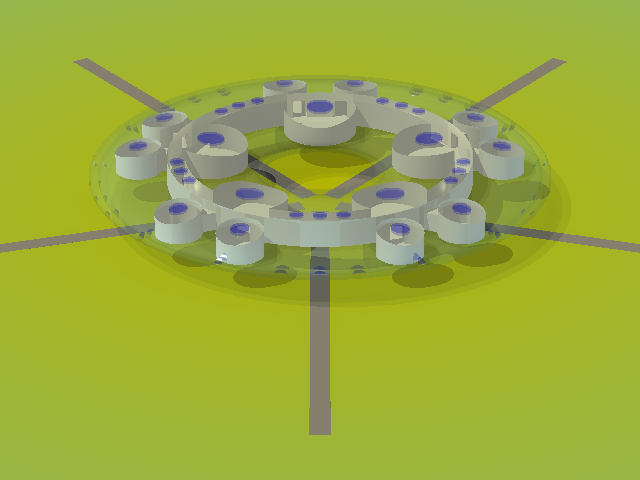 The illustration on the right shows this final version of the torus dwelling set within the farmlet gleba, with its lake and two crop circles. This design does, however, result in a dwelling of 24 activity spaces, as show on the left. This is far too many for a normal family-sized dwelling. Consequently, for all its simplicity, the torus is not really a suitable form of envelope for my conception of a universal terrestrial dwelling. This final torus version of the dwelling was gen­erated by the POVray program lardocecu6.pov. 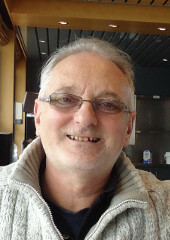 The program to optimise the room sizes for the hexagon-based version is lardocecu6.java.